31 December 2014: Short profile of Lerryn’s Cafe in Peckham in Guardian feature on energy efficiency initiatives by cafes. December 2014: Open access paper published in the January 2015 issue of Renewable Energy. January 2014: Still a few days left to see BBC’s excellent Inside Out London programme. The first half covers the increasing levels of energy theft being observed by energy companies and -18 minutes in – the programme looks at potential future solutions to the provision of more affordable heat and power in London. 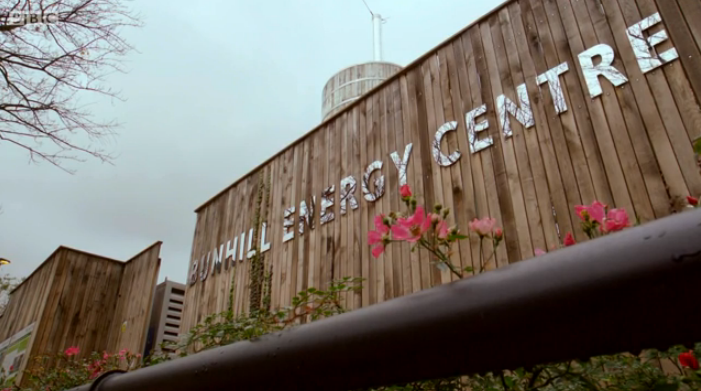 The growth in local energy solutions, such as combined heat and power (CHP) plants and the introduction of new district heating schemes are highlighted, including recent projects installed in Islington (Bunhill CHP) and the heat network constructed from the SELCHP waste to energy scheme, which transports low cost heat to 2,500 households in Southwark with an approximate 22% reduction in heating charges. November 2013: The Guardian highlighted in a recent story that the London HQ of Al Gore’s business is to be based in a new office development on Regent Street which has included a wide array of onsite energy measures installed including a gas-powered fuel cell. “Climate campaigner and former US vice-president Gore said the £400m Quadrant 3 redevelopment showed a “sophisticated commitment to sustainability”. The headquarters of his sustainable investment company, Generation Investment Management, will be sited in the new buildings. “The cell was developed by US company FuelCell Energy. It will emit 38% less carbon dioxide than using electricity from the grid and heat from gas-fired boilers, according to the crown estate, which says 350 tonnes of carbon dioxide emissions will be saved per year. Unlike fossil-fuel-burning power plants, the fuel cell produces power with virtually no nitrogen oxide (NOx), sulphur dioxide (SOx) or particulate matter (PM) pollution. The new plant forms part of the central energy system that serves 500,000 sq ft of offices, shops, flats, restaurants and hotels in the Quadrant development.” Read the full Guardian story here. Further detail on the installation of the fuel cell can be read here – which has been undertaken by Edinburgh based Logan Energy. 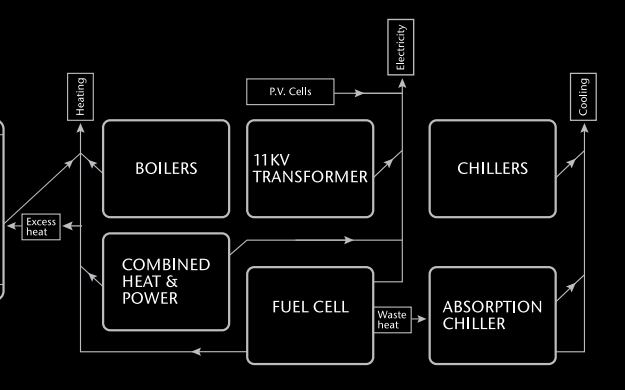 The Quadrant 3 development has a number of other onsite energy measures installed (including a Combined Cooling Heat & Power plant, thermal stores and photovoltaics – see diagram below), as set out in the property brochure. Another new London development to include fuel cell technology is that on 20 Fenchurch Street (more commonly known as the ‘Walkie Talkie’ building) which has installed a 300 kWe fuel cell, details of which can be read here and here. Transport for London installed a fuel cell CHP in their Palestra building in Southwark back in 2010, details of which – including a video presentation – can be seen here and here. 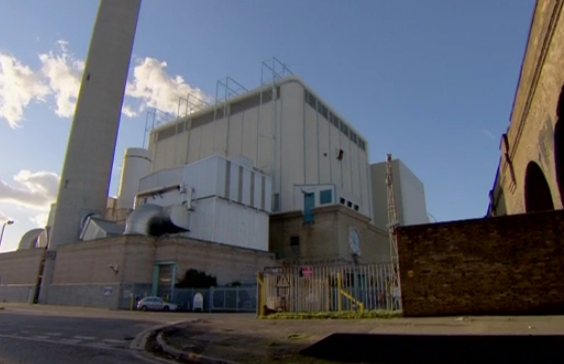 October 2013: A presentation made at BRE’s recent ‘Developing heat networks in the UK ‘ provides a little background – and a few images – behind the new Southwark district energy network taking waste heat from the SELCHP energy from waste (EfW) plant and directing to five nearby housing estates -presentation here (and directly here). Further information on the following post here. 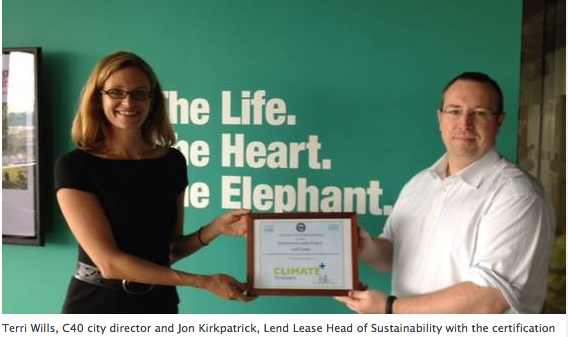 October 2013: London SE1 community website recently reported that “Lend Lease’s Elephant & Castle programme has been formally recognised by C40 Cities Climate Leadership to become the third project of 18 globally to reach ‘participant’ status. The ‘climate positive participant’ rating is conferred by sustainability experts acting on behalf of C40’s Climate Positive Development Programme in partnership with the Clinton Climate Initiative. Some further background to this scheme and its carbon-reduction plans can be read in an earlier post here. 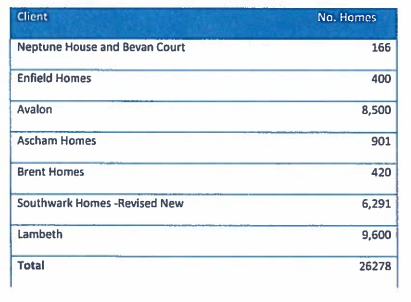 August 2013: COSPP article giving a little more background to the SELCHP heat offtake scheme in Southwark (more of which here).